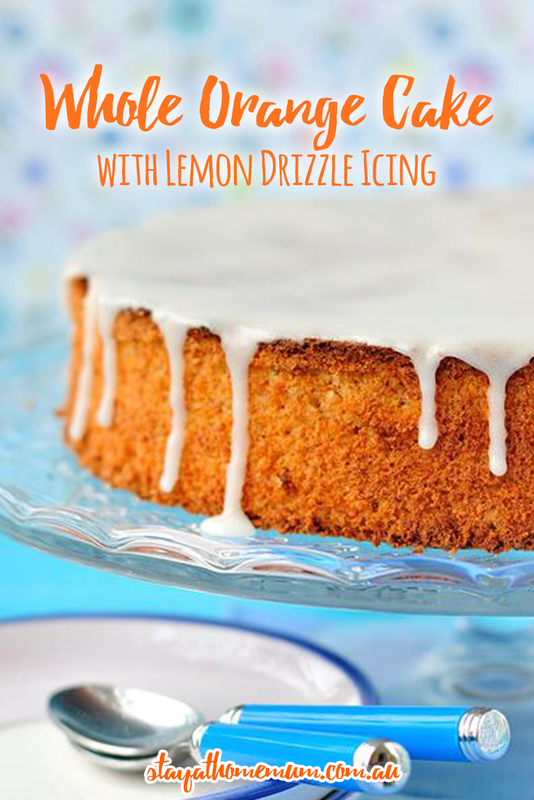 Whole Orange Cake with Lemon Drizzle IcingSo simple and sweet! Whole Orange Cake with Lemon Drizzle Icing is a delectable cake recipe that uses the entire orange (skin and all) for a truly rich orange cake! Perfect for serving with double cream. Because if you’re going to be bad, you may as well be really really bad! Heat a saucepan full of water until boiling point. Add the orange (do not cut) and place the lid on the saucepan. Cook for one hour, then drain. Place the orange in a food processor, and process the orange until pureed. Fold in all the other ingredients. Pour mixture into a well grease round cake tin and bake for 40 minutes. While the cake is in the oven, make the lemon drizzle by stirring together the butter, lemon zest and icing sugar in a bowl until combined. Add the lemon juice and continue stirring until you have a smooth, liquid glaze that can be easily drizzled. Add more lemon juice if needed. Whole Orange Cake can be made gluten free by substituting the self raising flour with one cup of almond meal, and 1/2 cup of gluten free self raising flour and a teaspoon of baking powder. Whole Orange Cake is best eaten fresh on the day it is made. Not suitable for freezing. You can use mandarins in this recipe instead of oranges!